Equipped with a high-performance HID lamp that has a max. brightness of 1,750 lumens. *Click “YouTube” to link there. During video play, the resolution (360p, 480p) can be changed for higher quality. 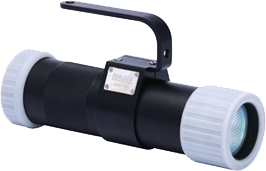 Can be used for a variety of applications including as a video camera, digital camera, and diving light. With use of a highly efficient, high-performance HID (metal halide) lamp, it can provide approx. three times (75W) as much light, even compared to halogen lamps with the same output. With a color temperature of 6500K, which approaches that for sunlight during midday, this lamp can be said to be the perfect light for underwater shooting. When used as a video light, mount the light to the Sea Arm using the accessory adapter for camera arm. When used as a dive light, fix the Hand Grip to the light. LED power indicator on the main body shows how much battery power is remaining (green: FULL, amber, red: Low). Powered using a rechargeable Li-ion battery with less memory effect. Max. of 120 minutes of continuous lighting with a fully charged battery. With 3 light filters for different lighting purposes: "Diffusion," to widen the beam angle and to change from sport to flood; "Yellow," for better visibility when foggy; and "Amber," to bring the color temperature down to 5600K. With a multi-volt type of charger that supports 100V to 240V. Can be used for charging overseas as is. Features an overpressure relief valve for safety. Equipped with an explosion-proof valve as a fail-safe measure to protect against rupture, etc. due to internal chemical reaction dynamics or differences in pressure between internal and external. * Can be used out of water (for a max. of 60min. ).